Hidden and Lovely. What's special in this beach is getting there! Although you can get very close to it by car, finding it is not easy! I myself forget from time to time so you will need help! Nowadays people know about this beach, so it's not so quiet anymore, but on weekdays you could be lucky and have it nearly all for yourself. 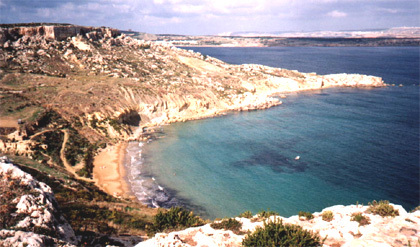 Its situated deep in the country side of Mellieha, and going there by bicycle or by walk is an experience to itself. Even getting lost here isn't that bad! The beach itself is nothing special, but I can guarantee that a day there is not wasted! Prepare whatever you need with you, but don't carry too much. Getting there. Go to Mellieha first. Just before entering Mellieha at the round-about you will see signs so Selmun. Selmun is a sub region of Mellieha. Before reaching the Selmun Tower there is a road to the left just at the side of a solitary block of houses. Take this road and stay on it. You will get lost a few times, but finally you will come to the critical part, a very sharp turning to the left in between two columns. There is alot of bamboo at this turning, and if you don't take it you will go up a dead end. By Bus, forget it, but you can walk there from Mellieha. It will take you around one and a half hours if you don't get lost. Half an hour by bicycle and its definitely worth doing.